One of the most unusual bands of the modern electronic scene is again in Moscow with new shows! This would be an important and most expected event in the city club life. 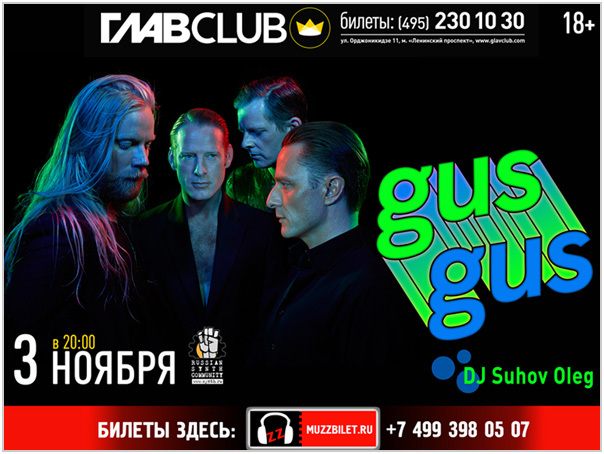 Wizards from Iceland GUS GUS will play a show in GLAVCLUB in support of their new album «Mexico» along with best hits from «Arabian Horse» and other albums. Their homeland is the most mysterious country of the globe. Their music is a unique alloy of techno and soul. Their fans are even more famous than themselves - Beck, Blur, David Byrne and Beastie Boys. It all started back in 1995 in Iceland and keeps running until present time. Their previous album «Arabian Horse» was a true sensation in the world of dance electro. Perfect compositions at the junction of 90’s house and city soul in the spirit of Massive Attack got an immense amount of music lovers of all kinds to fall in love with them. Those were from frequenters of fancy discos and aesthetes of exotic to rife music lovers, from students to editors’ of glamorous magazines. The band’s new album «Mexico» is a fresh look at the modern club electro. It’s characterized by refined ambient sounding, intelligent sound arrangements, attention to slightest nuances and relaxed and unexceptionable vocal duo. Gus Gus have managed to find their own unique sound again at crossroads of classic influences. In their music you can hear echoes of 80’s synth-pop, garage and 90’s trance. «Crossfade» known by many from previous shows was released as the first single. It has already led German club charts. Every Gus Gus show is almost a ritual action played in roles where charmed audience sways in trance, every single sound pierces the crown, vocals sound as if from outer space, the musicians on stage look more like shamans and every harmony pictures mysterious landscapes of the “land of ice”. It seems that going out from the venue there will be northern light on the sky. ATTENTION! Please refer to the hall scheme to choose your preferred VIP tickets.